Although this species spends the greater part of the year in our most Eastern States, and in countries still farther north, many individuals remain in the mountainous districts of the Middle States, and breed there. In severe winters, it migrates as far south as the neighbourhood of the city of Natchez, on the Mississippi, where I have shot several and seen many more. In Kentucky it is not a rare bird at that season, but along the coasts of our Southern States I have never met with it, nor have I heard of its having been seen there. In spring and summer it retires from the low lands of the Middle States to the mountainous districts, where it generally remains until autumn. About the 20th of April, the male and his mate are seen engaged in building their nest, in the covered and secluded parts of the forests. I found several of their nests placed on bushes not above ten feet from the ground, without any appearance of choice as to the tree, but generally towards the top, and placed in a fork. The nest is as large as that of the Robin, and is composed externally of coarse grasses, leaves and moss, internally of fibrous roots, over which is a bed of the feathers of the Wild Turkey and Pheasant (Tetrao umbellus). The eggs are four or five, of a dull cinereous tint, thickly spotted and streaked with light brown towards the larger end. The period of incubation is fifteen days. The young are at first of a dark bluish colour, but when they become covered with feathers, they assume a dull rufous tint above, and are transversely barred with zig-zag lines from the throat to the abdomen. In this State they remain until late in autumn, and might seem to one not acquainted with them to be of a different species. They remain with their parents all that time, and not unfrequently even during winter. Caterpillars, spiders and insects of various kinds form their first food, together with small fruits; but as they grow up, their parents bring them the flesh of small birds, on which they feed greedily even before they leave the nest. This valiant little warrior possesses the faculty of imitating the notes of other birds, especially such as are indicative of pain. Thus it will often mimic the cries of Sparrows and other small birds, so as to make you believe you hear them screaming in the claws of a Hawk; and I strongly suspect this is done for the purpose of inducing others to come out from their coverts to the rescue of their suffering brethren. On several occasions I have seen it in the act of screaming in this manner, when it would suddenly dart from its perch into a thicket, from which there would immediately issue the real cries of a bird on which it had seized. On the banks of the Mississippi, I saw one which for several days in succession had regularly taken its stand on the top of a tall tree, where it from time to time imitated the cries of the Swamp and Song Sparrows, and shortly afterwards would pitch downwards like a Hawk, with its wings close to its body, seldom failing in obtaining the object of its pursuit, which it would sometimes follow even through the briars and brambles among which it had sought refuge. When unable to secure the prey, it would reascend to its perch, and emit loud and discordant notes of anger. Whenever I could see it strike its victim, it appeared to alight on its back, and instantly strike its head, which on such occasions I have several times found torn open. If not disturbed, the Shrike would then tear up the body, and swallow in large pieces, not well cleared of the feathers, every part excepting the wings. It now and then pursues birds that are on the wing to a considerable distance. Thus, I saw one follow a Turtle Dove, which, on being nearly caught, pitched on the ground, where its skull was bruised in a moment; but the next instant both birds were in my possession. The courage, activity, and perseverance of this species, are quite surprising. In winter, when insects are scarce, and small birds rare in the Eastern States, I have known it to enter the cities and attack birds in cages. During my stay at Boston, several of them were brought to me, that had been caught in the apartments in which cages containing Canaries were kept, and in every instance after the little favourite had been massacred. Near the same city I observed an individual poised on wing, in the manner of our Sparrow Hawk, for several minutes at a time, over the withered grass and sedges of salt water meadows, when it suddenly pounced on some small bird concealed there. Although its feet are small and apparently weak, its claws are sharp, and it is capable of inflicting a pretty severe wound on the finger or hand. It bites with great pertinacity, and will seldom let go its hold unless its throat is squeezed. Its flight is strong, swift, and sustained: it moves through the air in long undulations which have each an extent of twenty or thirty yards, but it seldom rises very high, unless for the purpose of obtaining a good point of observation, and in its usual flight merely passes over the tops of the low bushes rapidly and in silence, in starts of from fifty to a hundred yards. I never saw one walk or move on the ground. They are extremely fond of crickets and grasshoppers, as well as other kinds of insects, and they feed on the flesh of birds whenever they can procure it. The individuals which I have kept in cages, appeared well pleased with pieces of fresh beef, but they generally remained dull and sullen until they died. As it was only during winter that I had them in confinement, when no coleopterous insects could be procured, I had no opportunity of observing if, like Hawks, they have the power of throwing up hard particles of the food which they swallow, although I should suppose this to be the case. Their propensity to impale insects and small birds on the sharp points of twigs and on thorns, which they so frequently do at all seasons of the year, is quite a mystery to me, as I cannot conceive what its object may be. I have represented three of these birds of different sexes and ages, and therefore differing in colour and size. GREAT AMERICAN SHRIKE or BUTCHER-BIRD, Lanius Excubitor, Wils. Amer. Orn.,vol. i. p. 74. LANIUS SEPTENTRIONALIS, Bonap. Syn., p. 72. 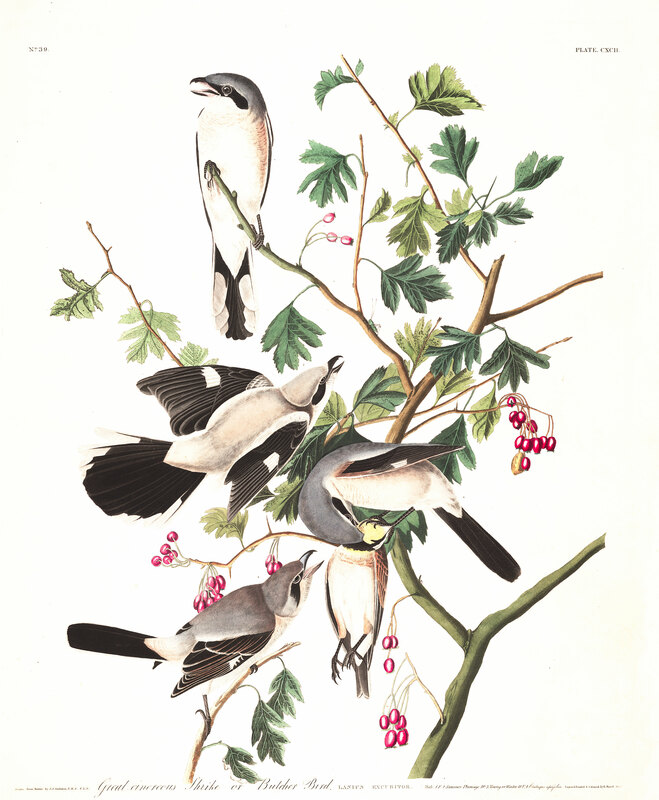 LANIUS BOREALIS, Greater Northern Shrike, Swains. and Rich. F. Bor. Amer.,vol. ii. p. 111. GREAT AMERICAN SHRIKE, Nutt. Man., vol. i. p. 258. GREAT AMERICAN SHRIKE, Lanius Excubitor, Aud. Orn. Biog., vol. ii. p. 534;vol. v. p. 434. Fourth quill longest, third little shorter, second shorter than sixth, first half the length of second; tail long, graduated; bill brownish-black at the end, paler towards the base; upper parts light ash-grey, the ends of the scapulars and the upper tail-coverts greyish-white; a streak of whitish over the eye; loral space and a patch behind the eye brownish-black; first row of smaller wing-coverts, larger coverts, and quills, brownish-black; secondary quills and coverts edged and tipped with whitish; base of primaries white, forming a conspicuous patch when the wing is extended; tail-feathers brownish-black, outer web of lateral feathers, and more than a third of its inner web from the tip, white; the extremities of all the rest, excepting the middle two, also white, gradually occupying less extent on the inner feathers; lower parts greyish-white, the fore part of the breast tinged with brown, and faintly marked with transverse undulating lines of dark grey, as are the sides. Female similar, but with the head and neck slightly tinged with brown, and the lower parts more banded. Lanius Excubitor of Europe differs in being considerably smaller, and in having the white on the wings and tail more extended, the bases and a great portion of the inner webs of the secondaries, except the inner three, being of that colour, as well as the bases of the primaries, and forming a conspicuous spot when the wing is closed, and the outer tail-feathers being often white in their whole length. Male, 10 2/12, 14 2/12. Breeds from Pennsylvania northward. During winter, migrates westward to the Mississippi, and as far south as Natchez. Not uncommon. The dimensions of an adult male presented by Dr. T. M. BREWER of Boston, and preserved in spirits, are:--Length to end of tail 10 2/12 inches, to end of wings 7 5/12, to end of claws 8 2/12; extent of wings 14 2/12; wing from flexure 4 8/12; tail 4 8/12. The roof of the mouth is nearly flat, with a median prominent ridge anteriorly, and two papillate ridges behind. The posterior aperture of the nares is 7 twelfths long; the tongue is slender, 7 twelfths long, emarginate and papillate at the base, concave above, horny toward the end, the margins lacerated, the tip slit. The width of the mouth is 7 1/2 twelfths. The oesophagus, [a b c], is 2 inches 10 twelfths long, of considerable width, having an average breadth of 4 twelfths; the proventriculus, [b c], 5 twelfths in width, its glands forming a belt only 3 twelfths in breadth. The stomach, [d e], is broadly elliptical, 11 twelfths long, 9 1/2 twelfths broad; its muscular coat thin, being composed of strong parallel fasciculi, its thickest part not exceeding 1 twelfth; the epithelium thin, tough, reddish-brown, longitudinally rugous. The pylorus is very small, with a semilunar margin. The intestine, [e f g h i j], is 12 inches long, its greatest width 3 twelfths, the least 2 twelfths; the coeca, [i], 2 twelfths long, and scarcely 1/2 twelfth wide, their distance from the extremity 1 inch; the cloaca, [j], oblong; its width about 6 twelfths. The stomach contained portions of a mouse, including two front teeth. The trachea is 2 inches 4 twelfths long, 2 twelfths broad at the upper part, 1 1/2 twelfths at the lower; its rings about 55, with 2 dimidiate rings; it is considerably flattened below, but roundish at the upper part. The bronchi are of moderate size, with about 12 half rings. The muscles are as in the Thrushes, there being four pairs of inferior laryngeal, of large size. In another individual, the tongue is 7 twelfths long, the mouth 8 twelfths in width; the oesophagus 3 inches long, its average width 3 1/2 twelfths; the intestine 12 inches long. The lobes of the liver are very unequal, the left smaller. The aperture of the ear of moderate size, roundish, 2 twelfths in diameter. The contents of the stomach were a small bird and some insects. CRATAEGUS APIIFOLIA, Mich. Fl. Amer., vol. i. p. 287. Pursh, Fl. Amer. Sept., vol. i. p. 336.--ICOSANDRIA PENTAGYNIA, Linn. --ROSACEAE, Juss. This species of hawthorn bears a great resemblance to that so common in Europe. It grows on the banks of rivers and in damp woods in several of the Southern States, and attains a height of twelve or fifteen feet. The leaves are somewhat triangular in their general outline, inciso-lobate, the lobes acute and deeply toothed; the flowers white, and the berries ovate or oblong, of a deep red colour.